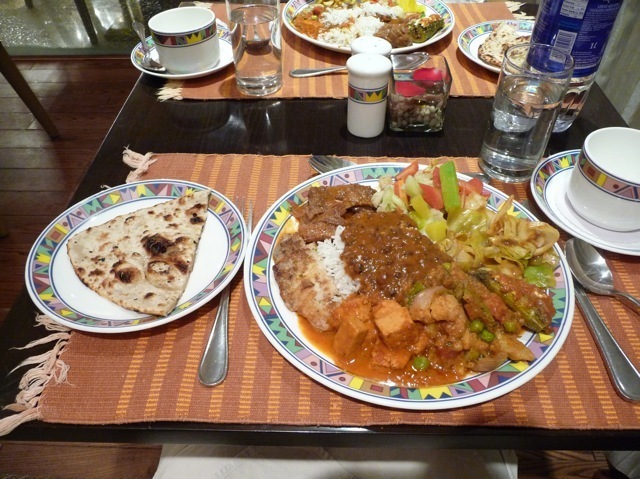 I love Indian curry, but my body does not like it and revolts afterwards. So I had to refrain from eating curries. Upon deciding to visit India for 6 days, we were tempted to bring 6 days ration of instant noodles. But the tour company assured us that we would survive the meals. To our joy and surprise, curries in India are not burning chili hot as served outside of India. We found the Indian curries to be full bodied, richly flavored, robust, delicious, and not burning chili hot. We ate them for the entire trip and our bodies took them in stride. We were in northern India, which serves milder flavors than its southern cousin. This discovery will make us curry lovers again and we will demand to be served curries not burning chili hot. We visited the Victory Palace in Jaipur. 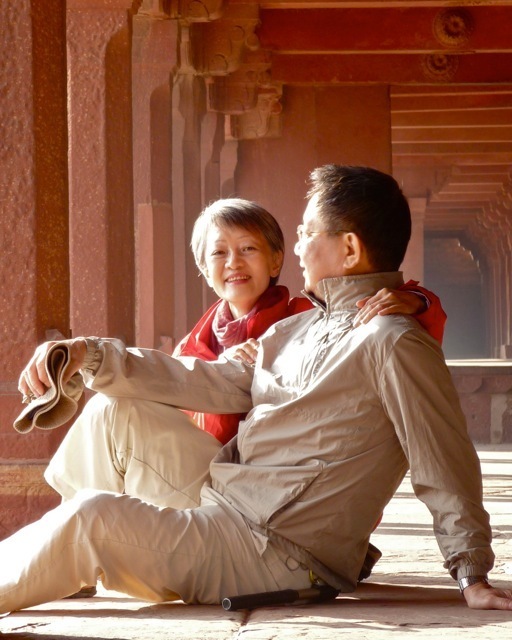 Its red sandstone columns made perfect background for this nice picture, taken by a tour-mate who has the artistic touch. Our tour group of 16 was very nice and friendly. It made our trip very enjoyable. Although the Victory Palace was built by Muslim Moghuls, they were tolerant and paid respect to the other religions. 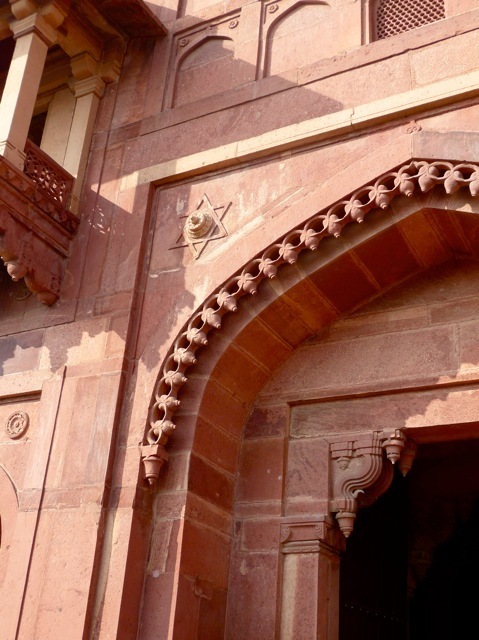 This doorway arch contains elements of Hindu, Jewish, and Muslim religions. Wouldn’t it be nice if such Muslims were among us today? 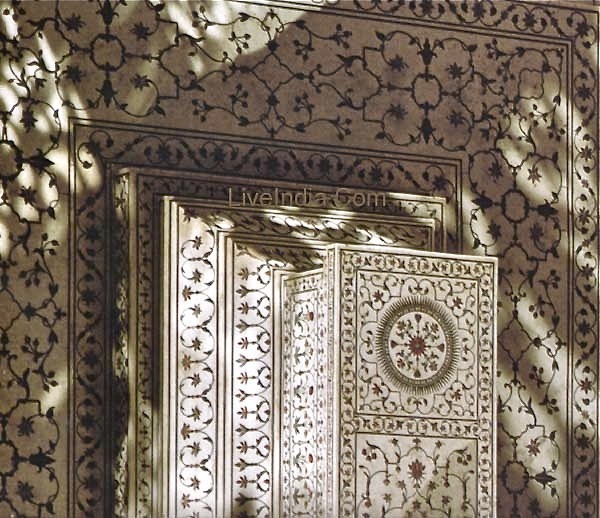 The Wind Palace in Jaipur is but a facade of filigree stone panels. Upper levels open to the sky and not to a building behind the facade. 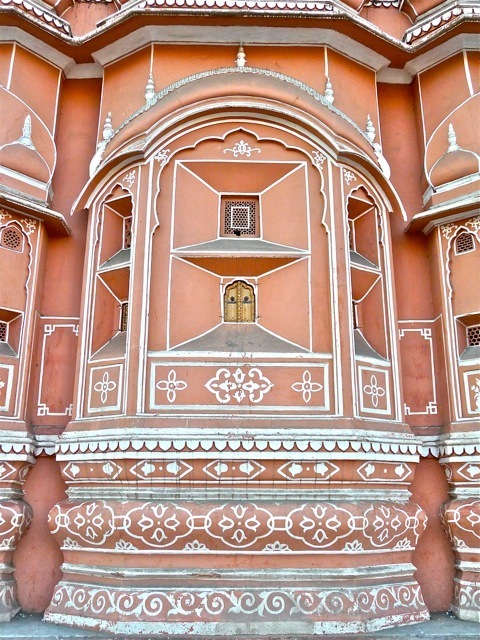 The women of the maharaja were kept in the harem and could peek through the filigree stonework at the street life below. But for such a large building, it has very tiny windows with cute little wooden doors. 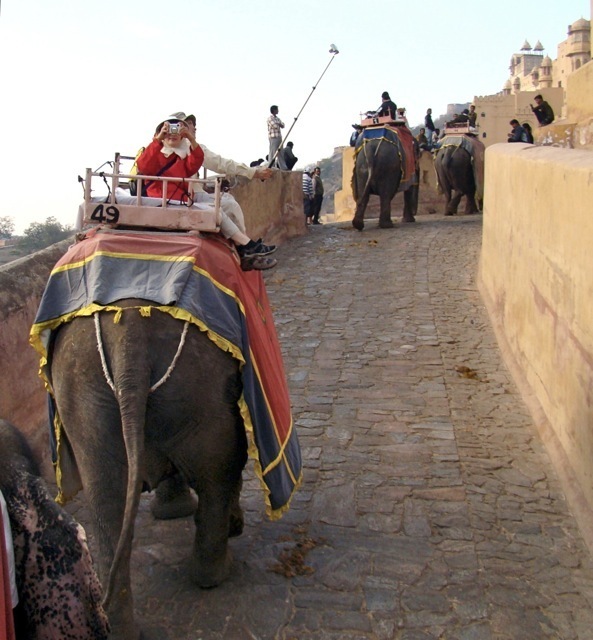 We rode an elephant up the ramp to the Amber Fort palace. it was a undulating ride as the elephant lumbered on. Sally obviously enjoyed the experience. A tour-mate on another elephant caught me using my PhotoSolo contraption to take pictures of ourselves. 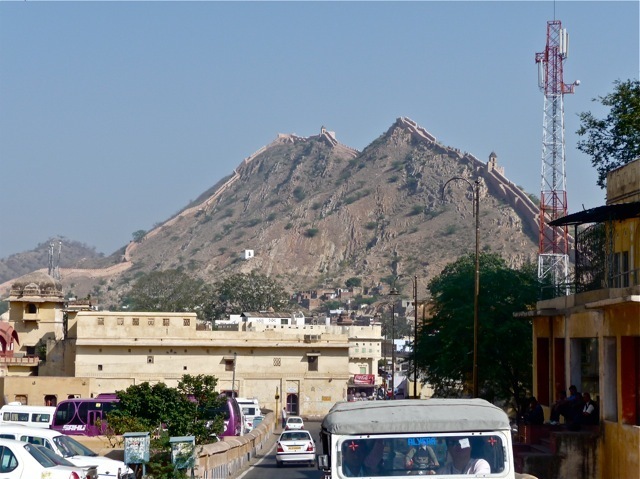 Jaipur was the capital of Rajasthan state, and its maharaja built a long surrounding wall to protect the city. From the distance, it looks like the Great Wall of China. 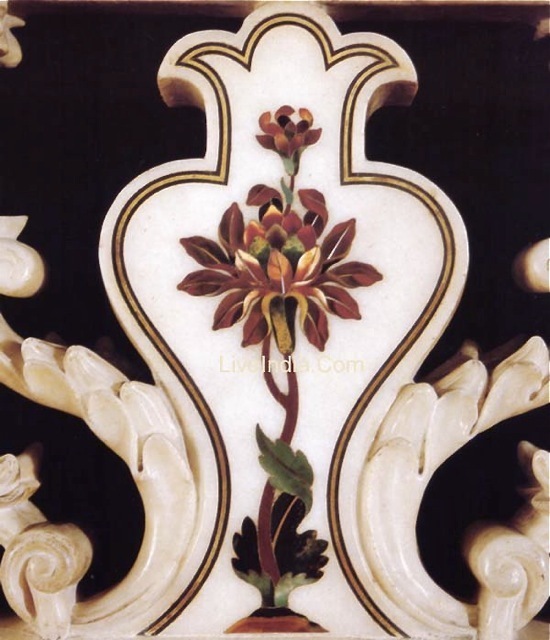 A palace in Jaipur was richly decorated with white marble panel inlaid with semi- and precious stones. The fluidity and elegance of the artwork captured my heart at first sight. 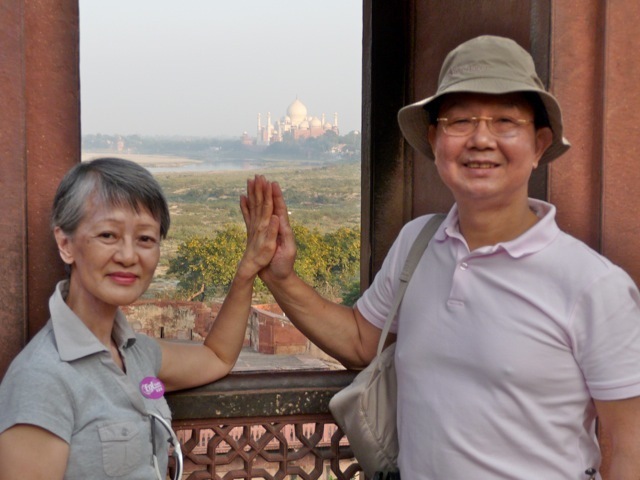 In Agra Fort, Sally and I held hands in the presence of Taj Mahal. The Agra Fort was decorated with semi- and precious stones. But they were not inlaid into the marble walls, but only pasted on. The British desecrated the artwork by prying out the stones and took away the loot. 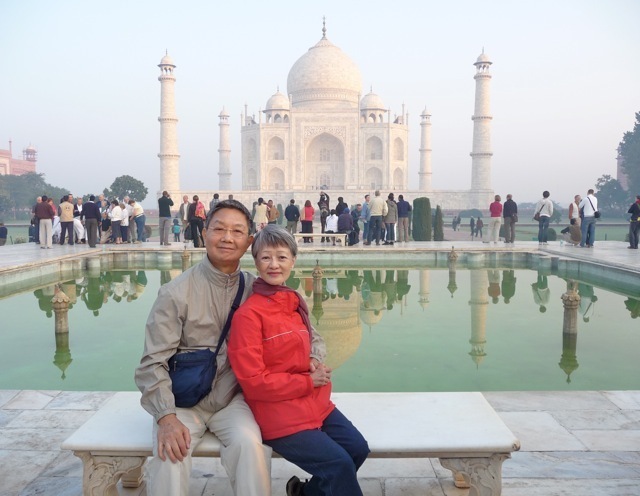 Sally and I took this obligatory picture with the Taj Mahal and its reflection in the background. We went there before sunrise, and did not have to contend with hordes of tourists. The sight of the Taj Mahal was truly impressive. Its massive presence, ethereal lightness due to its white color, and the perfect symmetry made it a awesome beauty. We were glad we had the chance to see this gem in person. Sally hammed it up as she was overjoyed in the presence of such beauty. 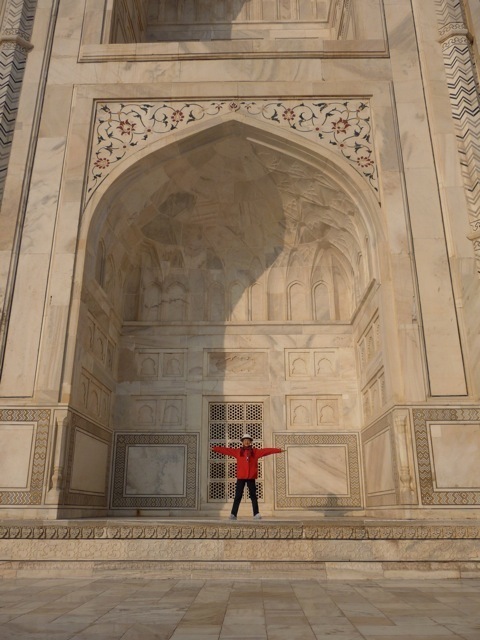 Later in the morning, the white marble of the Taj Mahal glistened in the full sunlight of a perfect day. The Taj Mahal was massive, but it looked like it could rise up from its foundation and float in air. 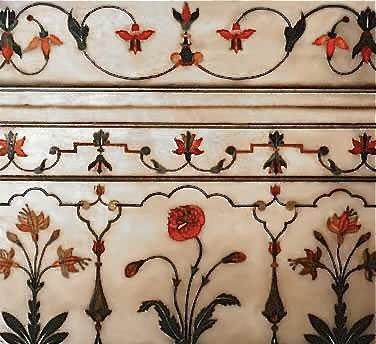 I read about the inlaid marbles of the Taj Mahal and was awe struck by their beauty. The workmanship was flawless, and the design was life-like in their fluidity. These are inlaid on the outside of the building. 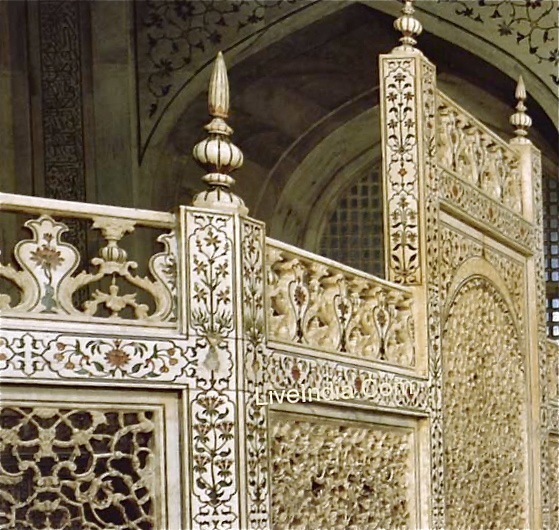 The most beautiful part of the Taj Mahal is in the interior of the mausoleum. The tourists were warned not to take pictures inside, and we obligingly followed the order. Some tourists took pictures anyway and nobody interfered. 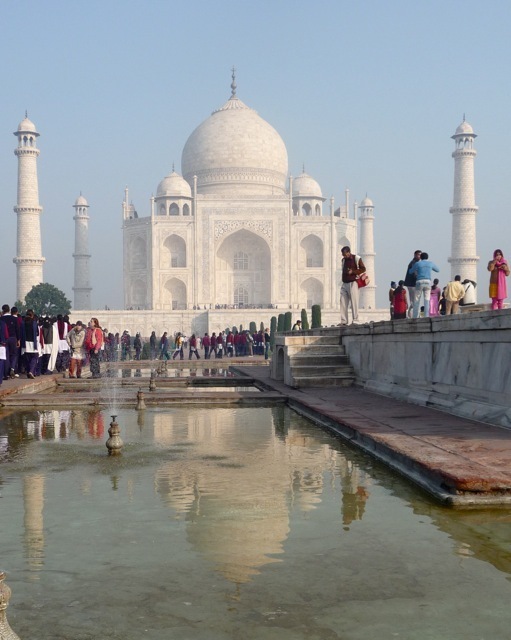 To show the beauty we did not photograph, I post some pictures from the web site http://www.liveindia.com/tajmahal/3.html. 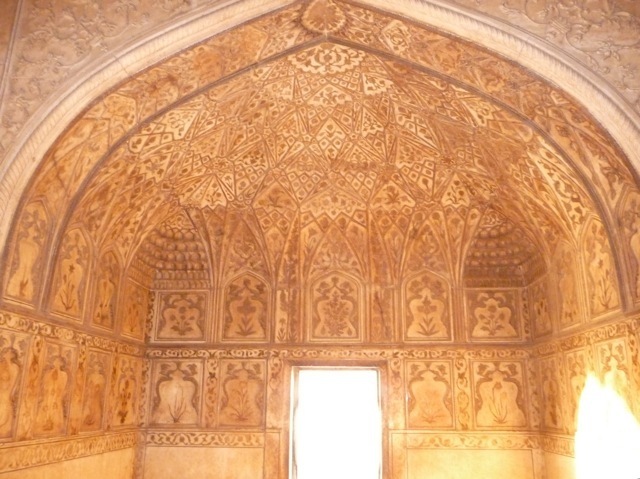 The big room contains the tombs of Shah Jahan and his beloved wife, Mahal. They are surrounded by a screen of filigreed marbles. We spent half an hour admiring the detailed artwork on the screen. The cenotaphs were in the dark and too far away for close inspection. 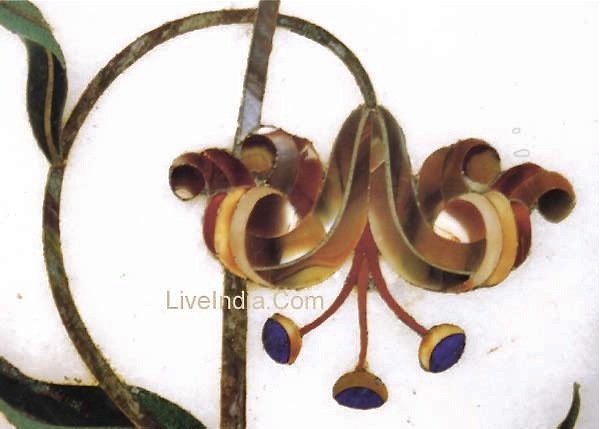 The inlaid flowers are made with semi- and precious stones. The red petals are rubies that glisten in translucent glow when a flash light is placed on top of them. Details of a small section of the screen. The choice of the stones gives this flower the perfect texture of a real flower. 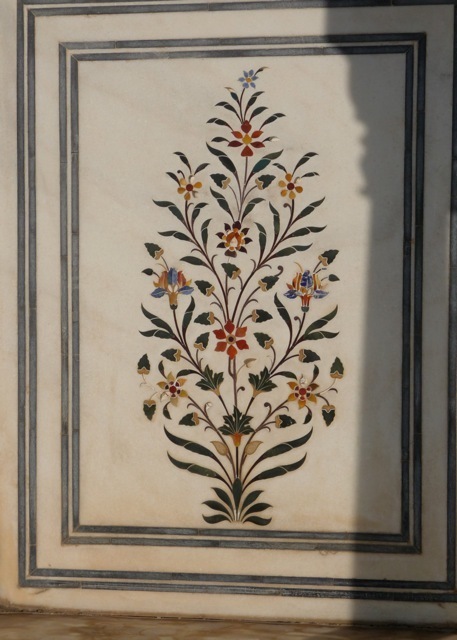 The cenotaphs and their surrounding are covered with intricate and finely detailed inlaid work. Yet they are not overwhelming and remain elegant and light. 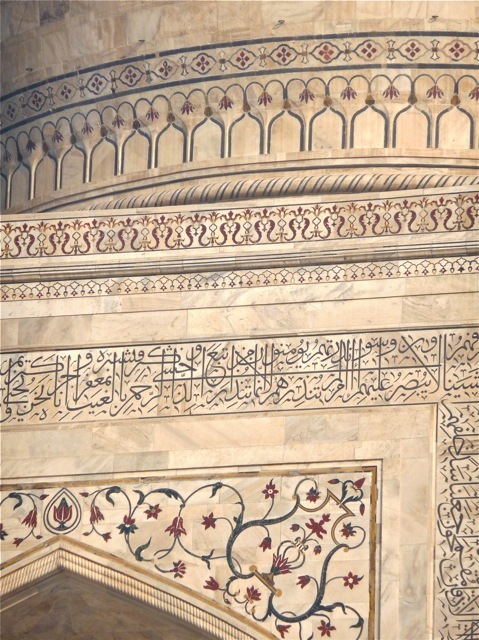 Details of the inlaid work on the cenotaphs. 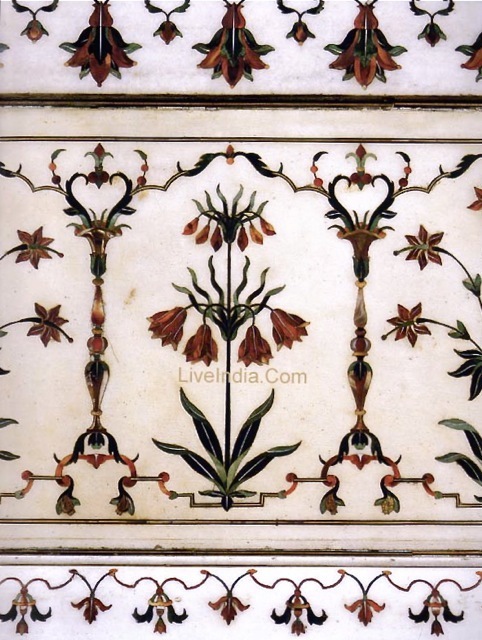 The great workmanship demonstrated in this flower is repeated thousands of times throughout the Taj Mahal. 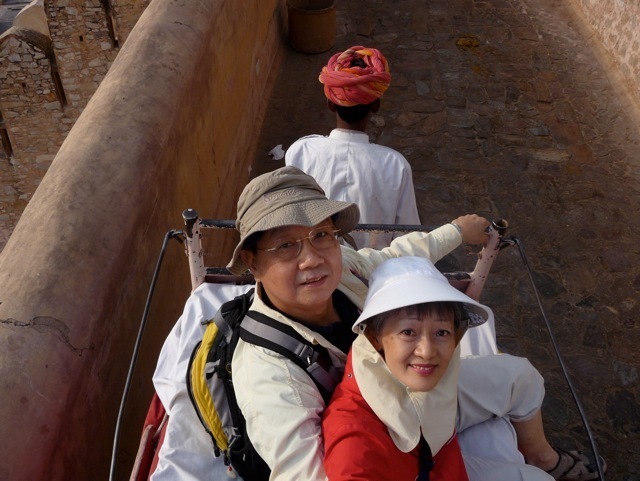 After the climatic visit to the Taj Mahal, we went to Delhi for our flight. 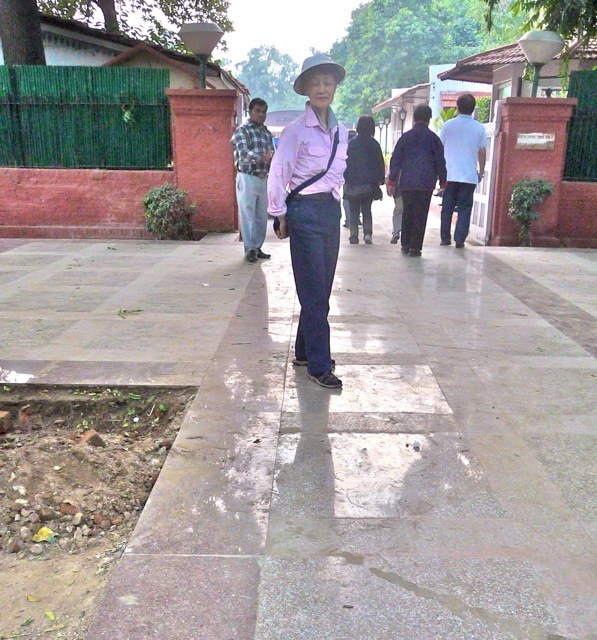 Before we did, we visited the site of Mahatma Gandhi’s assassination in 1947. The sidewalk being laid is polished granite, making it a dangerously slippery place to walk on when wet. 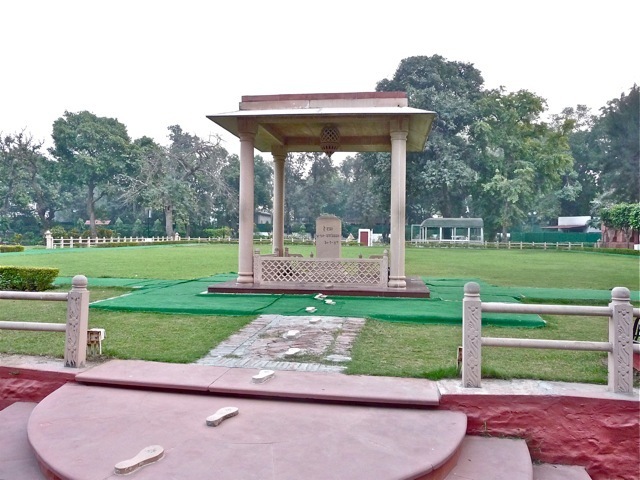 The site of the assassination. To show my respect for this great man, I bowed. Posted by Robert Wu on Friday, December 11, 2009, at 12:58 am. Filed under Uncategorized. Follow any responses to this post with its comments RSS feed. You can post a comment or trackback from your blog.